Last week’s topic was regarding what to expect as our cats age into their senior years, today we discuss the caring of our elderly dogs. Dogs provide the greatest loyalty and companionship that one can receive. As such, it’s up to us to care for our best friends as they age, making sure that their changing needs are met and they live as comfortably as possible. There are a multitude of differences between the varieties of senior dog foods, each offering different nutritional balances. With this in mind, how does the owner of a dog select the right food for their aging friend? The first step, which is vitally important, is to visit a veterinarian first to ascertain what the dietary needs are for any elderly pet to maintain proper weight and health as they age. Through a series of tests, veterinarians can determine what varieties of food are most appropriate to manage or prevent particular age-related conditions, or what supplements can compliment their changing regimen. A reduction in activity is natural as our dogs grow older, as they have trouble maintaining the same level of energy for extended periods of time. Due to a deterioration of cardiorespiratory function, reducing the lengths of their regular walks and cutting out high-impact activities can ensure that they stay healthy while still getting the exercise that they require to stay fit. 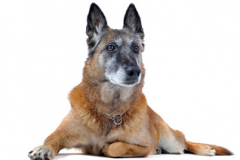 There are a number of new behaviours that are common for aging dogs, some may seem harmless at first but could be an early indication of underlying conditions. Here are a few behaviours to keep an eye out for. Some dogs display a tendency to be more talkative. This can be the cause of some loss of hearing, soreness from age-related issues such as arthritis or perhaps even disorientation from a cognitive dysfunction. Cognitive dysfunction can be the cause of other symptoms as well, including excessive chewing, destructiveness and fixation. Dogs, like humans, also can lose their mental acuity as they age. As many of our elderly family members can attest, the loss of vision and hearing is a life-altering and difficult adjustment to make. For our dogs, the loss of these major senses can cause disorientation, changes to sleeping patterns and also the development of new phobias and fears as the world around them gets darker. Continence can become an issue for our dogs as they enter their later years, first witnessed through an increased frequency of trips outside. This can have an effect on sleeping patterns, with some dogs finding it difficult to make it through the night without urinating. If incontinence develops into messes inside of the house it is important to book an appointment with the vet. There are many reasons and conditions that a dog might start to mess in the house, none of which are intentional defiance, so it is important to find the root problem as early as possible. Elderly dogs are very sensitive to weather and temperature changes, have trouble regulating their body temperature. Ensure that aging dogs are able to stay warm in colder months with blankets, beds, coats & boots. Similarly, they should be kept cool in the summer with fresh water or even cooling packs under blankets if they find it helpful. To prevent potentially fatal situations, senior dogs should not be left outside in cases of extreme temperature, in winter or summer. Additionally, accommodate sore and arthritic dogs with easier access to the items that they need to stay happy and healthy. Keep their amenities to the main floor of the house in order to let them avoid the painful climbing of stairs. This can also help to avoid potentially dangerous falls.